Indonesia is an archipelago of some 13,000 islands located on the Equator in the Pacific Ocean. It enjoys the second highest level of biodiversity in the world after Brazil and its many plants and animals are a mix of Asian and Australasian species. Rainforest covers 60% of the country and tourists to Indonesia can enjoy a wide range of coastal ecosystems like beaches, dunes, coral reefs, grass beds, mudflats and mangroves. One of the main attractions in the country and the one thing travelers to Indonesia want to witness for themselves is the Borobudur Temple. Located in Magelang, Central Java the temple is from the 9th century and is listed as a World Heritage Site. It is the single most visited place in the whole country and Buddhists still use the site for pilgrimages once a year called Vesak. The temple itself was built with a pyramid shaped bottom, three circular platforms on top and a monumental stupa on top of that. 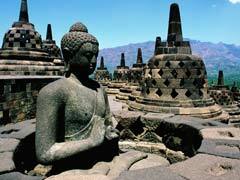 Around the circular platforms are 72 openwork stupas with a Buddha statue in each. 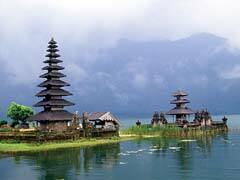 Perhaps the best known area for Indonesia tourism is the island of Bali. With its mountains and beaches it is known as the ‘land of the gods’ and offers everything from fine dining, surfing, scuba diving sites and forests teeming with monkeys and carved temples to spas, meditation areas, yoga classes and spiritual awakenings. Many travelers take beach vacations in Bali as the area is known for its white sand beaches, marvelous ocean swells and its laid-back, meditative attitude. Bali also offers the Indonesian traveler bird walks, ridge walks along the many dormant volcanoes and a marine walk that allows you to walk the ocean floor play with the many fish species and marvel at the coral formations, all from within a helmet which allows you to breathe and keep your head dry. Lombok is an island east of Bali that is also a great beach vacation destination. The island offers great beaches, numerous places to dive and snorkel and the main tourist area of Senggigi. Many travelers to Indonesia combine Bali and Lombok into one vacation to the sun. Jakarta is Indonesia’s capital city and offers vacationers many churches, mosques, cathedrals and museums to visit. Jakarta Old Town is full of such buildings as well as the post office, governor’s house, railway station, shops and places to eat. It is a great place to get a feel of the history and culture of the country as well as Jakarta itself. Kidzania is an interesting concept for a children’s museum as it allows them to be adults, if only for a short time. As an educational museum, it lets kids try out many adult jobs, where they get a ‘salary’ and get to ‘bank’ their money, showing them how us adults have to work for the things we want to buy. Kids are allowed to ‘try on’ their chosen professions and have the chance to switch at will which is all part of the fun. Travelers to Indonesia who just don’t have the time to see all of the islands can instead check out Indonesia in Miniature, which shows the cultures and history of all parts of the country in one place. All of the famous landmarks and buildings from the different provinces are shown to visitors who can take a cable car over the man-made lake to see all of Indonesia set out below. An IMAX theatre, dances and cultural events round out the tour. The jungles of Borneo and the islands of Komodo are excellent places for visitors to take in the biodiversity during eco-tours. In Borneo, see Camp Leakey, which is a wildlife reserve and feeding site for the orangutan. 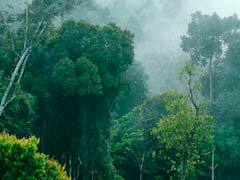 The shrinking jungle can no longer support all the wildlife so people have stepped in to make up the shortfall. Here visitors can help feed the primates and see other species of animals in their protective area. Tanjung Puting National Park is a rainforest/river combination area that allows tourists to Indonesia the chance to live, eat and sleep on an African Queen inspired boat that goes deep into the jungle where monkeys, orangutans, crocs, snakes, birds and many other species can be seen. These eco-tours last for 3 or 4 days and immerse the traveler in the jungle for a once in a lifetime adventure. The group of Komodo Islands are famous for the Komodo dragon as well as their 50 dive sites. At about 400 km from Bali, these islands (Komodo, Rinca and Padar) are also great for eco-tours where travelers to Indonesia can take guided walks and learn about the conservation of many species that are indigenous to the area. Buffalo, wild pigs, deer, whales and dolphins can also be seen in and around the islands. Indonesia is a great vacation destination for those who want to learn more about the biodiversity of the area or those who simply want to get away from it all in paradise.